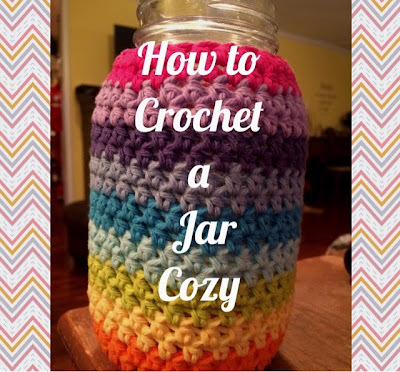 I've had a few friends ask me how to make one of my mason jar cozies. They are a lot of fun and pretty simple. 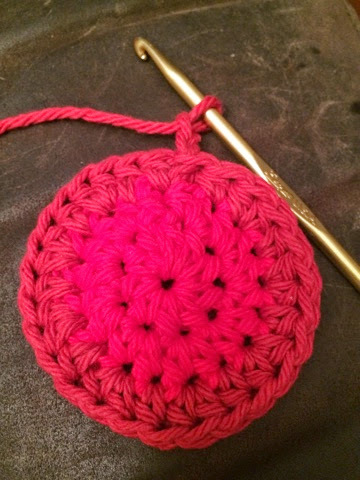 If you don't have the time or the desire to crochet one yourself, I would be most glad to make one for you! My etsy shop is here! But, if you would like to give it a go yourself, here's how I make it! 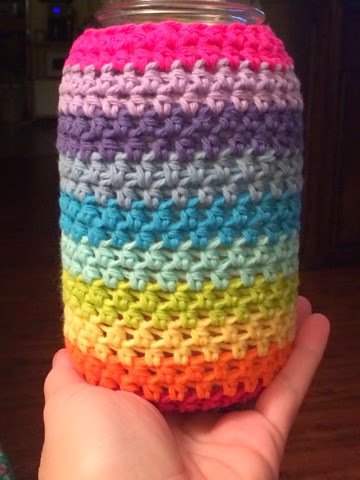 This pattern is for a regular mouth quart sized mason jar. Begin with the color of your choosing. I love the colors of the rainbow. I love the meaning of the rainbow, how God gave it to Noah how I remember that God always keeps His promises! I love color! The more the better AND these colors make me happy. So with true rainbowish colors, I started with red. The reason for the cotton yarn is because it will help to insulate your jar. You won't have that 'sweating' problem that mason jars normally have. We have used mason jars to drink out of since we were kids, so it is not a 'new fashion' for me. It's an old hat. Your ice will keep longer and I LOVE ice in my drinks... so this works BEAUTIFULLY! 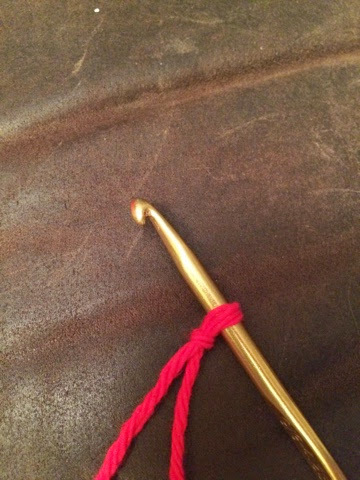 Start out with a slip knot on your hook, like so. 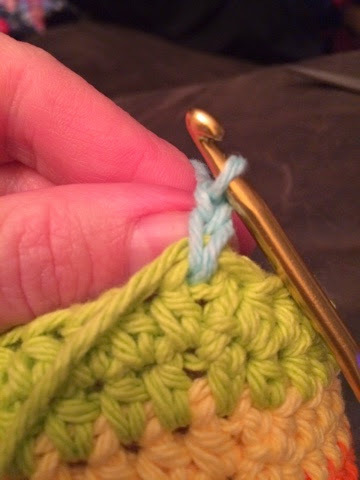 Yarn over, insert your hook in 3rd chain from hook, YO (yarn over) and pull up another loop. YO and pull through all 3 loops on the hook. 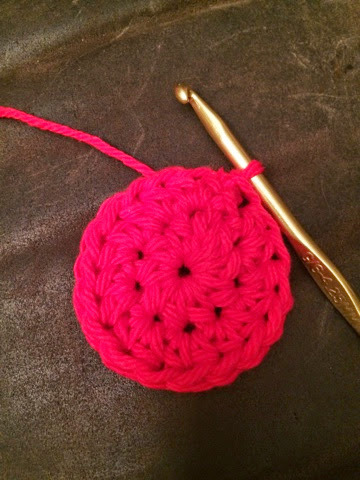 You just made a Half Double Crochet or HDC in crochet lingo. 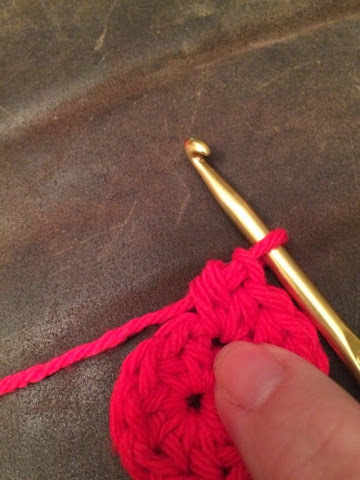 Using that same chain, crochet 8 more half double crochet stitches in that chain, slip stitch and your have finished your first round. You will end up with a circle, like this below. What I did was make 2 rounds in each color of my choosing. Instead of changing with each round, I go two. It gives a bit bolder of a color and I like the way it looks best! 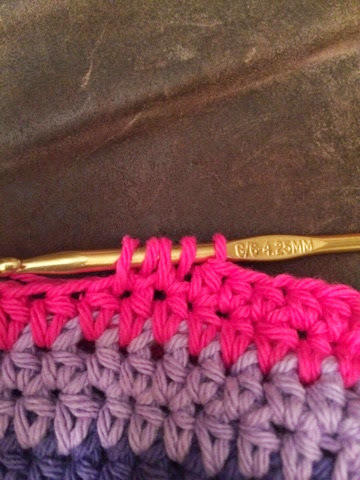 Treble crochet in the very first HDC (half double crochet) from your previous round. In this round you are going to HDC in each previous HDC twice. 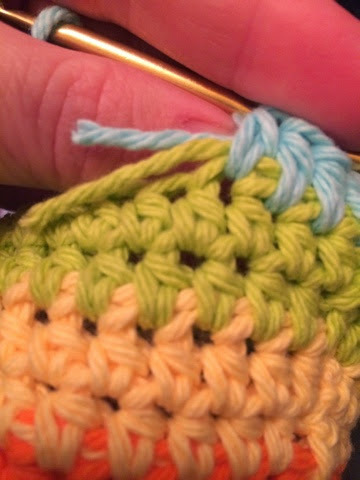 Look at the picture below, I am finishing up a second HDC in that stitch where my finger is pointing. Go all the way around and you will end up with 18 stitches. 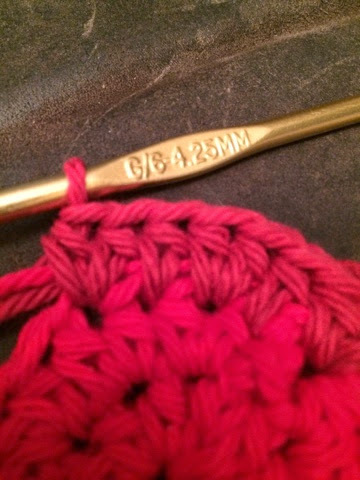 9 sets of 2 treble crochets in each of the previous rounds! Hooray!!! Now is the time when you switch colors. Even though in my crummy pictures you can't tell too much, but I did change colors here. It's a more muted red. In this round, which is round 3, you are going to do this sequence. and on and on through the whole round till you get to the end, and on that last stitch, make 2 HDC. You will end up with 28 total stitches. 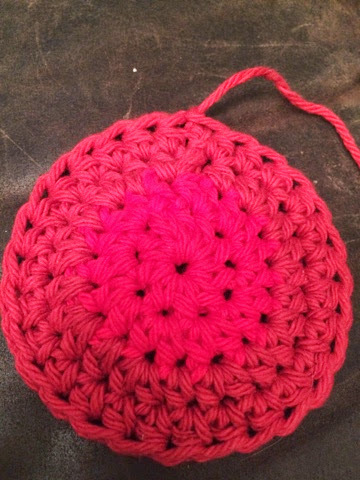 Also when you finish a color leave a bit of a tail to weave in or to stitch over with your next colors. 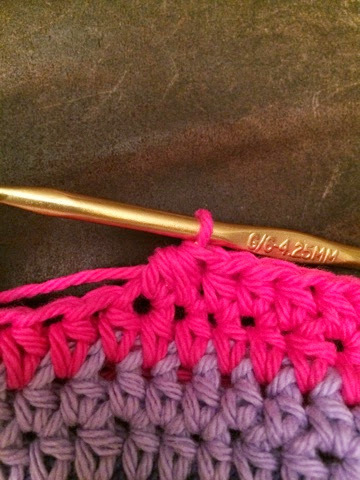 On and on, you are going to make 2 rows of one color with 28 stitches on each round. 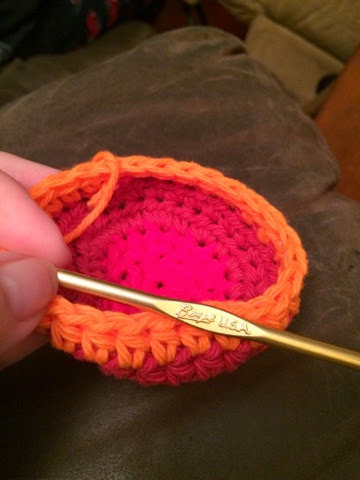 The cozy will begin to make a cupped shape because you are not adding to it. You are keeping it the same 28 stitch size. Don't fret about switching colors... it's easy. Fasten off your last and slip your new color in, chain 2 and you are ready to go again! This is what I was talking about when I said you could stitch over the tails if you desire. They are becoming enclosed in my stitches. Like below. On my jar, I have 11 colors of 2 rounds each. It's not hard, follow me. Begin by HDC 5 times, like normal. BUT, then in spot 6 & 7, you will do your first decrease. To do that is like this. 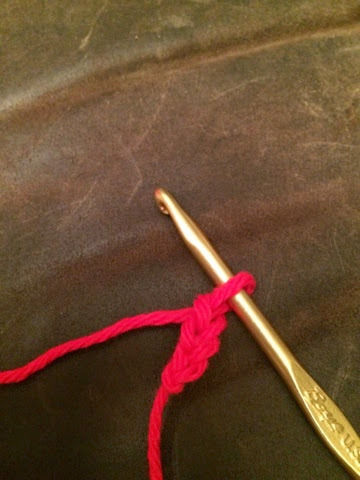 YO insert hook in stitch 6, YO bring up a loop, you will have 3 loops on your hook. 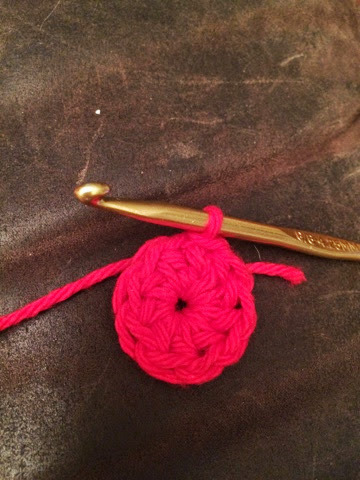 YO again and insert hook in stitch 7 YO and pull up another loop, you will now have 5 loops on your hook. That is your first decrease! 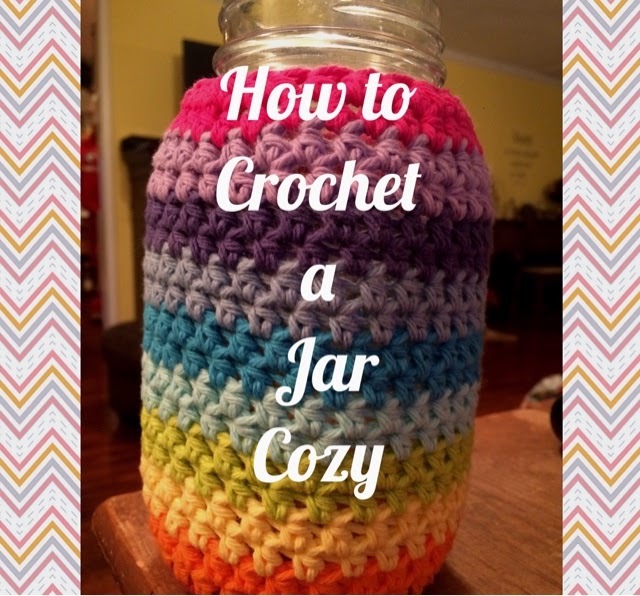 You need to decrease on this row to make a fitted neck for the jar. Now, go right back to it and HDC in the next 5 stitches. After 5 stitches, do another decrease. You will do this all the way around until you have finished the round and made 4 sets of 5 HDC followed by a decrease. Your cozy will be snug. You want it to be. Too loose and it won't set well. Slide it on BEFORE you put your drink in. It will be more difficult to slide on if the jar is wet. There you have it! A job well done, and a beautiful, happy, colorful handiwork that you can use daily! Like I said, (not trying to be pushy) but if you choose to buy one instead... I am most happy to make one for you! Just follow my link and visit my Etsy shop! Thank you for this very easy tutorial! You are most welcome, Melissa! Thank you so much for your visit! :) Come by again soon! For a wide mouth jar would we just not do the decreases to the pattern? For a wide mouth jar would we just omit the decreases part?